Many things have appeared on toast: Marmite, Vegemite, jam and even Cylons. Now a designer’s invented a toaster that can burn pretty much anything onto your morning slice, including the news. 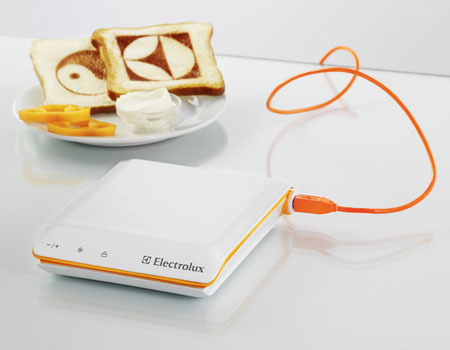 Inside the toaster is a network of toasting “modules”, each heated by a hot wire. Each module can move by 30° and, once the user selects what they want on their toast - excluding a topping, of course - the modules align themselves and burn the appropriate content onto the bread. The appliance is a finalist in design competition run by manufacturer Electrolux and designer Sung Bae Chang said he got the idea whilst - you guessed it - making some toast. No plans to manufacture the toaster on a mass scale have popped up yet.